By the name you may have discovered that this is a security app that detects when your phone has been removed from your pockets. Upon being removed from the pocket, the phone would proceed to blare out an alarm, all the while vibrating non-stop. The only way the alarm and vibration can be deactivated is by unlocking the phone itself. 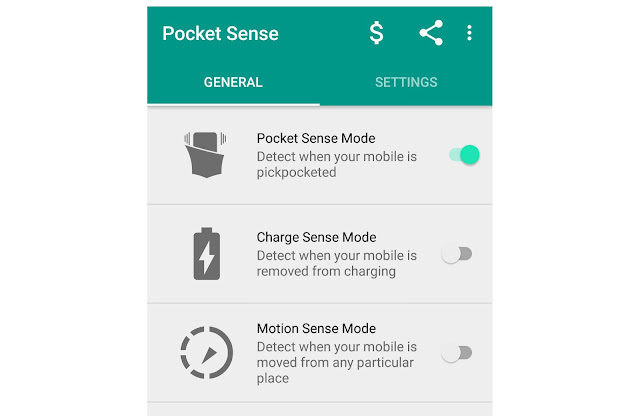 This Pocket Sense app comes with many modes like Pocket Sense mode, Charge Sense Mode, and Motion Sense Mode. we are discussing this all modes one by one. Read more:- How to install two WhatsApp in single mobile? 1) pocket sense mode:- You will get notified through an alarm if any mobile thief takes the mobile out of your pants pocket. You can turn off the alarm simply by unlocking the mobile or by turning off the pocket sense mode. 2) Charge Sense Mode:- When you have placed your phone on mobile charging and you want to know who is using your phone? Enable Charge Sense mode in the app. You will get notified through an alarm while someone disconnects the mobile from charging. 3) Motion Sense Mode:- Notifies you through an alarm if someone accesses the mobile from where you placed it. and more Features like: You can delay the alarm for few seconds to stop getting triggered instantly and Adjust sensitivity of the sensors. Also, you can download this types of application on IOS. “iAntiTheft is the best anti-theft alarm security app for your iPhone. your internet connection & keep your personal information safe. I hope you can save your phone from thieves by reading this tutorial, if like please share this post on social media and tell your friend’s about this post. Is this app available for iOS? Or any similar app like this? Yes, many apps are available for iOS like “iAntiTheft” or “Mobile Security & Anti Theft Protection for iPhone” etc..